1) Target those last-minute shoppers. Haven’t started your Christmas promotions yet? Well, you can be sure that a large number of customers haven’t given Christmas shopping a second thought. Use this to your advantage! Target this audience group with relevant messaging and imagery, make life easier by providing solutions to common Christmas shopping troubles (e.g. ‘Christmas gifts for your mum/nephew sorted!’) and use promotions like free express delivery to help lighten the load for your customers. 2) Think GLOBAL. 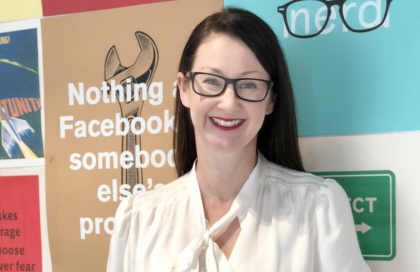 Did you know that nearly 210 million people are connected to a business in Australia on Facebook? While this is only one platform where you can target your customers, it shows us that there’s no need to limit your promotions to a local audience. Based on our research, the top countries who are engaging with Aussie businesses are from the US, UK, Canada, India and Pakistan, so consider leveraging Facebook’s multi-country and multi-city targeting tools, as well as our dynamic-language tools, to increase the opportunity to build new customers this holiday season. 3) It’s all about you. There’s no denying that any large retailer entering Australia may impact your competitor set, but it’s important to remember what’s unique and exciting about your brand and promote it accordingly. You’ll also need to be smarter about who you’re targeting and how. There is a wealth of data available via online platforms to help you better target your audience, and you should constantly be testing and evolving your approach (for example, running A/B tests of static ads vs. a more immersive video format) to make sure that your promotions are being effective. 4) Use your budget wisely. While broadening your audience is a great way to create new opportunities, one of the most cost-effective ways to advertise during the peak holiday season is focusing on people who are already familiar with your brand to drive them to purchase in store, online or in your mobile app. Use your existing subscriber lists and social media platforms to connect with these audiences. 5) Get even more creative! You’ll already know how hard it can be to cut through the clutter and the Christmas rush doesn’t make this any easier. There are so many creative tools available for businesses to take a simple product and make it pop. Plus, with creative apps like Instagram’s Hyperlapse and Boomerang, great natural light, a simple tripod, and backdrops that contextualise your product or service, you can turn any space into your creative studio. Facebook’s Mobile Studio is also a good place to start if you’re looking to push your content development further. 6) It’s obvious… but get on mobile. Last year was the first time we’d ever seen more products sold on Facebook on mobile vs. desktop (53%). And it’s not just us – research is consistently showing that we’re entering a new era of mobile-first shoppers, whether it’s researching and deciding on a product to buy in-store, or buying directly from mobile. In fact, this year 51% of people expect to complete a majority of their holiday purchases on a mobile device. Businesses should make sure that their websites are compatible on mobile and that they are using the social media platforms available to target and engage relevant customers. 7) Don’t forget about your in-store customers. We know that mobile is where people are, and that advertising on mobile drives purchases online, but purchases will still happen in-store. We also know that purchases in-store have been influenced along their purchase journey by mobile advertising. On Facebook, you can use the ad formats (Store Visits) that have been created specifically for these potential customers, to advertise the store nearest to their physical locations, send them into your stores and ultimately to the cash register. 8) Why not tell your story with video? Video is becoming a key marketing tool for businesses of all sizes. Based on our research, most people scroll through their Facebook or Instagram feeds on-the-go and as a result, videos are often viewed without sound. Because of this, try to incorporate captions, logos and products, so your message comes across clearly without sound. Instagram tools like Hyperlapse, Rewind and Boomerang can also help you to create videos that impress your online community. 9) Stuck for stories? Leverage your customers! Thinking about what kind of content will engage your audience can be tricky, but if you have existing brand advocates there is no better time than the holiday period to tell their stories. Has someone had a great experience with your brand or used your product in a creative way? Share their stories and invite your broader community to do the same. 10) It’s not all over after 25th December! After Christmas is an excellent time to deepen your relationship with the customers you worked so hard to acquire during the holiday season and convert them to repeat buyers with the right demand generation and cross-sell programs. Are you thinking about sales or trying to move excess stock in January? Then you can retarget customers who bought before Christmas or throughout the year with an offer, promotion or sale.